Do you have a sona/character you own that you identify with? Or multiple? Feel free to show them and talk about how you connect to them, or why (not). If you have multiple, are there differences in the way you connect to each of them? I think I can say that I identify with all of my characters as they all have parts of me put into their personality as well as parts of their own. 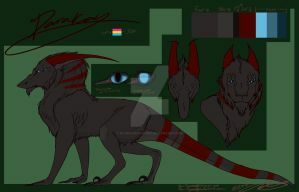 I had a fursona before. It was a dog with grey feathers and a nose similar to a beak, inside its fur was beige. I based it on the King Charles Spaniel because their ears reminded me of my hair sometimes. I wrote a journal about why I don't wanted to use it anymore, I forgot what I wrote, probably about representing myself not a good idea and stuff, but it was mostly because I liked the design and decided to keep it for a personal project. I still have the character ever since! That makes sense! Some people like representing themselves, others don't. It depends on what works for you! I don't wanted to confuse others about the reason of why I would use a sona. When I want to depict myself, I prefer using a random animal, mostly one-colored because my former sona was a pain to draw actually. That makes sense, yea! Simple characters are nice. 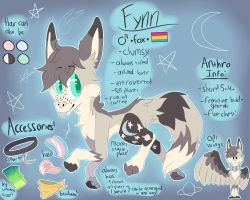 I made her in 2016 because my old fursona, Star, just didn't really represent me anymore. She is my baby and I love her too much! Mikayo! He's my main Fursona after my old one, Sandy. aw im so happy you do! Ack, I think I really missed the party on this one. Oh well, i'll still comment even if i'm a bit late. However, when I was like 8 again, I began writing a story called In The Mist (renamed The Red Mist) and SpottedLove was the main character. However, since humans are constantly changing, our personalities and stances are changing, especially in developmental years, I was changing. So SpottedLove's personality was changing. Since I had not written the story yet fully (I was only a couple pages in, hahaha.) I figured i'd be rewriting the beginning again. 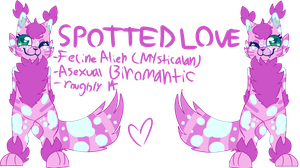 However, if SpottedLove's personality is constantly changing, it could pose some problems in the story. I don't mean like character development, I mean like inconsistency. Anyway, I decided to give her a defined character and personality. She became nearly constantly cheerful, kind of dumb, optimistic, VERY extroverted, creative, and she has a strong drive for justice. But then I had some internal conflict, because I wanted SpottedLove's personality to reflect mine, but at the same time that would kind of require taking her out of the story, or making a new fursona. I didn't want to do either. I tried making a different version of SpottedLove but that failed pretty quick. At this point, she's still my fursona. She represents me, she's the main character I use, I use SpottedLove as a character but I also kind of use her as myself. She is a big cutie who isn't exactly me but I don't love her any less for it. I do want to make a new fursona tho, and i'm trying out designs, so hopefully that'll be a thing that happens soon! That is such a ypung age to start making fursonas, but it's neat that you've had her for this long! Also, that's one reason why I feel using fursonas as story characters doesn't work out, because there's going to be a conflict with the character as a story protagonust and yourself as a person. It helps to have two different "versions" of a character, but that gets confusing too. I just prefer to separate the two, and not give my fursona a story. It works better for me that way. Good luck designing your new fursona too, I hope it works out well! Yeah, wish someone had told me that when I was 8, ahaha. Now it feels too late to change it. But I guess I haven't even started writing it yet really? Huh. Anyway. Thanks! This guy who i revamped while in the throws of some serious mental health problems I wanted to create a character who at the time was a positive role model to me, who could cope and deal with what life had thrown at him without being pulled down by it. He was sort of a character i strived to be like a year or two ago. I can connect with with the fact that he knows what its like not to be in control of whats happening inside his own mind and at the mercy of what ever manifests day to day. He also treats everyone with respect and tries to be fun and joyful, not to mention his room is 100% glow in the dark stars. Robert because we share similar life experiences. He loves tea , is sensitive to peoples hostility (EG: Bullying and threats), sleeps with plush animals , Can't drink water without cordial XD and hates being around strangers/ being touched by people who he doesn't know extremely well. Paul! because of his twisted seance of humor. Like stealing flowers from the graveyard to give to his girlfriend XD You wouldn't do it in real life but having a character who is shameless in his humor and can do anything you think up is really fun haha Not really a sona but more like a character who is your humor. That is super interesting! It's nice to read how they relate to you, and what parts of you they have in them. They all seem like very fleshed out characters! Yacni and Spanaster are such good old characters, I still love them! Cynthia is actually based on my first fursona who I didn't make :,) I had a fursona contest and I connected with a blue merle Aussie with teal (like Cynthia's paw pads, actually) markings that I hated only because they made me lose motivation to color him cuz I wanted him to be simpler. I was teased about being short (I'm not, I'm average height) by some friends which is why I made her a corgi and her name comes from a human OC that was made to be... somewhat like me? Anyway, she slowly became "happy me" for some reason... so I had to make another fursona who was more suited to sad things for vent. Also, fun fact: Even though I have a bunch of cat fursonas, I identify with dogs more. 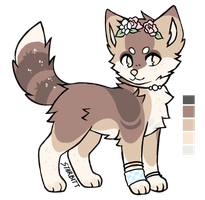 She was an impulse buy; @/StudioFelidae was making adoptables and I saw her and just... fell in love with her for some reason?? Like, her colors are just beautiful to me. Around the time I bought her I was trying to make a catsona anyway, so she just popped up at the right time. I use her for vent (unfortunately for her) but I love her a lot. She feels more genuine to my personality than Cynthia even though they're both just different sides of me. uhh I said I only have two fursonas (for now) but I technically have one more?? I don't really consider her a fursona but she's special to me and she's... based on me a lot since I made her from a meme that takes your birthday and stuff and... ANYWAY here she is. The next planned 'sona is gonna be a ghost cat who, when visible, looks kinda like a cloud of smoke? but she usually likes to form a body for herself out of ice (because at work one time I was getting a drink and I was super tired so I looked at the ice from the machine and said, and I quote, "I wish I was literally frozen water.") I like water and I like the cold, so this wasn't a weird conclusion to draw if you know me, but it was pretty hilarious anyway, especially given that I was mostly jealous of the ice because it didn't have to work like I was. I'm not sure how I'm going to accomplish her design yet which is why she isn't done. First of all, very sorry for the late reply, these have been in my inbox for ages! I love Cynthia, blue merle dogs are so pretty! Birchripple is really nice too, I like her colours! They all look really good. The idea of a ghost cat is really interesting, I love that! "I was mostly jealous of the ice because it didn't have to work like I was" That is the best explanation I have ever heard. Wonderful. Fynn is my oldest and my other main. he recently got a redesign as well! I think the reason why I like fynn so much is because he really looks like me. 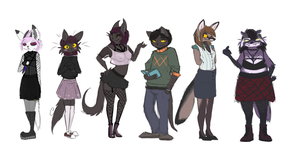 from the hair and clothing choices all the way down to the Fox species! he represents me perfectly. his original design was actually female but when I came out as trans, Fynn was born so I like that he really has changed with me. he also shares my name! They are all so nice! Their designs have such lovely colours, they all are really nice! Thanks for sharing, and I'm so sorry for the late reply! I've had these comments in my inbox for a while now. aww im glad you like them ! Basically all my characters represent some part of me in an extreme form. An example would be my character, Dipper who's the social bubbly me blown out of proportions. However one that just represents all of me is my character, Olivia. They both look really nice, I like their colours and designs! Ti is technically my fursona but I have kinda fallen out of love with them I rarely draw them and generally lack much of an attachment with them now. Which is sad because they are one of the few designs I still love years after designing them. They all have nice designs! Sometimes you fall out of love with characters, it happens. But it's good you have one that takes over the role Ti had! Yea! I'm really glad tbh made letting go easier for sure! Np I assumed as much haha!! She wears the same clothes I do, she has the same hair style, and she's basically me in anthro form. She's like a summary of myself, and she's the one I draw when I vent most of the time. I definitely draw her the most. I discovered very recently though that some of my other anthro characters also represent me, but in different ways. Bandit represents kinda who I aspire to be. If he was a real person, I would look up to him and see him as a mentor. He's a manifestation of my buried confidence and talent that shows itself when I'm super invested in something. He's also the quiet side of me that pipes up to make jokes sometimes, but mostly stays quiet. Nova is basically the friend I wish I had. She represents my inner frustration at the world, and the softness inside that not very many people see. To those that don't know her, Nova seems angry and tired with the world, but when you break through that outer shell, she's really funny and amazing to be around. She is very good at listening to others speak, while not overly sharing her own opinions. Alica is my goofy outgoing side! She is very unpredictable and hyper, and is always moving. She represents how I am around those that I am very comfortable with. I become a child, full of fun and happiness. Only a few people cause me to truly be like that. I like how drawing Alica can allow me to channel that loud side of me that I don't share often. Aspen is literally my quiet side. He doesn't say much, but wishes he could. When someone makes a joke, he would rather hide the fact that he thinks that it's funny than laugh. He's my shyness all funneled into one character. Copper is my awkward, oblivious, and musical side. Sometimes I am a pure disaster, and Copper is just that. He trips on everything, stutters, and can't make eye contact, just like me in a lot of situations. Copper is also a musical kid though, and band is one of the only things that allows him to be himself without being judged. That's how I felt in high school, so I feel like he fills that part of me well. He also is very good at listening, and is a super good friend to anyone that gives him a chance. So yeah! All of those characters represent parts of me that I either aspire to have or that I already have. Btw, this was super neat to write out, as it's all just been in my head up to this point. First of all, I'm so sorry for the late reply! These have been in my inbox for so long, it's been hard to reply to everything and sit down to read everything people wrote. But I did enjoy reading about them, they're all really interesting and I like the different aspects of you that they represent! Thank you so much for sharing! It's all good, I understand! Thank you! Because of certain events in my life, and getting to know myself better, I needed to separate some "rare used but important" parts of myself from her. 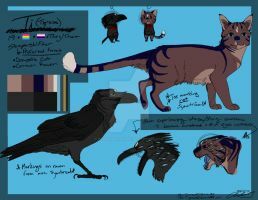 Especially my persistence and steadfast nature ( these represented by Petunia - she is absolutely my willpower and libido ), my cynicism and 100% logical approach ( represented by Shade - he is the only male fursona I have, and I regard him as an "inner voice of reason" or some kind of subconscious). I use them since 2011. Then in 2013 I had fallen in love, and I started dating with my mate, so my brain was suffocating because of the pink clouds. XD I totally changed a lot because of that, so I needed a new fursona ( Titania - who's a fox, because I wanted to be similar to Erexis. ) She's totally kind, naive, helpful, optimistic, and so on. I still keep her, because she's a part of me, even represents a whole chapter of my life. And actually I have some of her personality traits, but they kinda work like "reflexes" to real life events, and I don't really like these. Since I created them I've learnt a lot about myself, and I really love them, and actually glad I have all of them with me! That is really interesting! They all have really interesting fleshed out aspects, and the choice for animals related to their traits are really nice, too. I like that you drew them all lined up as well! wow this one is so unexpected! I see! That's interesting, they all have really neat designs!